Frontier Business and Mitel recently teamed up to present the latest in unified communications (UC) solutions to attendees at the Choice Hotels annual convention in Las Vegas, Nevada. The 63rd annual convention drew more than 5,000 hotel owners, general managers and hotel staff to learn and innovate during the multi-day event which opened May 9, 2017. Beyond the mere number of participants, Frontier Business Director of Hospitality Sales, David Johnson was impressed by the strong level of interest expressed by hospitality owners and operators seeking new and advanced technology solutions. Case in point – Johnson observed many hotels were seeking improved Wi-Fi solutions. “This year, we saw dozens of hotel owner/operators looking to upgrade their Wi-Fi technology, both in terms of improving guest experience and acquiring actionable, operational data for revenue enhancement,” Johnson explained. Frontier Business offers customized, installed Wi-Fi solutions from leading manufacturers including Ruckus, Cisco, Meraki and Adtran. With intense market-driven pressures on improving average daily rate (ADR) and revenues per available room (REVPAR), it’s no wonder hospitality leaders are looking for more intelligent Wi-Fi and UC solutions. 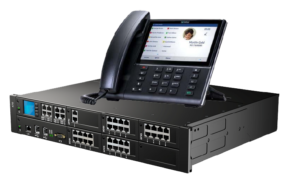 Attendees were very excited to learn how Frontier Business is including that in their approach as a new “in the box” feature of the soon-to-be-released Mitel MiVO 400 UC platform. The MiVO 400, which was debuted at the Las Vegas event, is the first Mitel UC Solution that is purpose built for the U.S. Hospitality market. It comes equipped with many built-in, standard features, including check in/check out, wake-up call requests, guest room maintenance tracking and call accounting. Front Desk personnel can access these powerful features from either the Mitel phone’s interactive display or application software. The introduction of the MiVO 400 enables Frontier Business to provide leading hospitality UC solutions to the “Select Service” hotel segment, which ranges from 30 to 150 guest rooms, improving the hospitality bottom line at a very competitive and compelling price point. Attendees of the Choice Hotels Convention were also pleased to learn about Frontier’s newly expanded footprint. The larger Frontier network is accessible to more Choice Hotels properties than ever before. Across 29 states, Frontier provides comprehensive WiFi networking, scalable broadband, phone solutions and comprehensive video services to the Hospitality Industry. The Frontier Business sales and engineering team will be busy working to respond to more than 100 new inquiries from the event. To learn more about solutions for voice, data and video from Frontier Business, contact David Johnson via e-mail David.Johnson4@FTR.com or direct-dial (570) 208-5089.